MacGregor, part of Cargotec, has launched a new crane compensation system for offshore ship-to-ship load transfers, offering substantially larger operating windows as well as safer and faster load transfers. "This robustly-tested technology can offer considerable commercial advantages to the offshore industry," says Ivar Fjermeros, Senior Sales Manager, Advanced Offshore Solutions. "MacGregor understands the complexity of ship-to-ship load transfers and the limitations imposed by unpredictable, non-synchronised movements in a seaway. With the systems currently available, a crane's capacity is effectively de-rated because of the conservative approach required to minimise risks associated with the relative movements of the vessels. "The safety benefits mark a significant improvement for offshore transfer operations," says Mr Fjermeros. 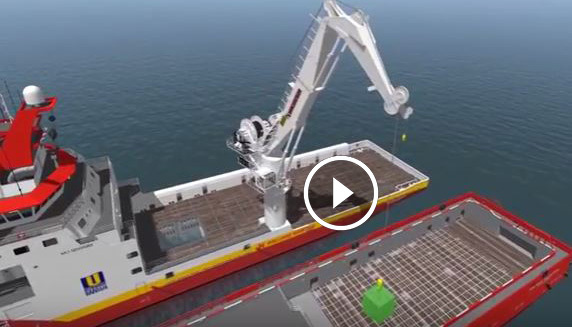 "When these are combined with maximising the crane's lifting capacity, improved load transfer times and a substantial, real-world increase in weather windows for ship-to-ship operations, this system really does offer some ground-breaking benefits."